We only recently started stocking these Butane Micro Burners and quite frankly, they are awesome. Easily portable throughout the entire lab and no need to run gas lines. 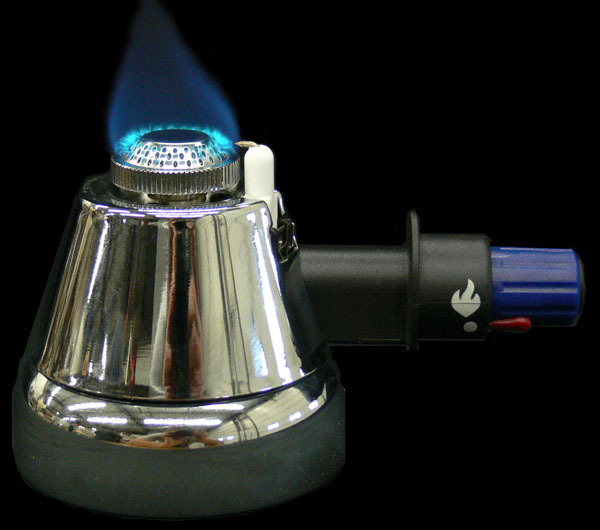 The Micro Burner is completely self-contained and has its own refillable Butane tank. Fully adjustable flame control from 0 to 100% simply by rotating the knob as shown above. No matches or igniters required.... the convenient piezoelectric push button on the handle produces a high voltage spark which ignites the burner instantly. Large diameter base offers excellent stability and tip resistance. Burns about 30 minutes with a full (32 gram) tank. Height: 3.35". Produces a flame temperature over 2,000° F. Excellent for all lab work including bending, shaping & melting standard flint glass tubing. Please note that due to shipping regulations, the burner must be shipped empty. You must fill the unit with standard butane lighter fuel (available at any grocery store for about $1.00 to $3.00) before use.